a comfortable cool medium to thrive in, right against the skin as it is. at the end of an old math problem." 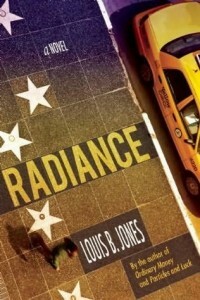 Author Louis B. Jones was new to me. I'd not heard of his other works or read anything by him. Radiance has changed that for me. What a fabulous discovery! All of the "action" takes place during the span of a weekend. Or, more literally, the characters are at "life altering" crossroads during the book's weekend time frame. With much attention to the details of minute to minute life, author Jones is a true wordsmith. He breathes life into every carefully chosen word. And that's the only double-edged sword that I found in Radiance. I wanted Jones to just get on with Mark's story. I soon realized that the words and phrasing that Jones used were as much a part of the story as his interaction with each and every character. I liked this book and enjoyed seeing Perdue's California as the backdrop for his truly messed up life. I liked the way Jones wove the stories together, I cared about Mark, Lotta and Blythe! I wanted to see what was going to happen to them. I gave it 3 1/2 out of 5 stars. I like a bit more "action" to my stories, I wanted a bit more story. BUT if that's the only fault, then it's a good read. This review copy was provided to me by the author in exchange for a fair and honest review.